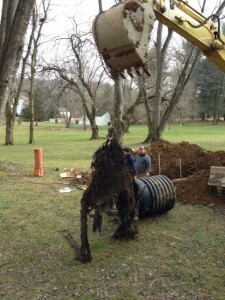 Roots can be a problem if they infiltrate into a septic tank. We have seen tanks completely full of roots. Maple trees and Willow trees are the worst culprits. Usually you can uncover the tank where the roots are getting in, remove the roots and seal the tank with hydraulic cement. Sometimes the tanks are in such poor shape that they need to be replaced. Since the roots usually extend out as far as the canopy of the branches, it is better to not allow trees to grow near your septic system.